We reported this a couple weeks ago, here is an update with photo’s. 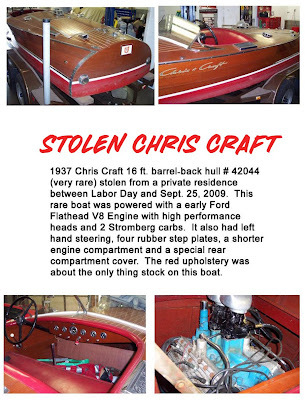 This boat was recently stolen from a suburban residence. We are enlisting fellow Woody Boaters and the public to help locate this boat. Please, this is a treasure. 11. Four bear claw vents on decks, factory rigged Chris Crafts only have two. 13. Throttle lever on left side of driver cockpit, not on steering wheel. 14. 18’ dual axle Custom Haul trailer brown/maroon in color, chrome rims, pipe style bow stop. Unless it's locked away and not used someone has to eventually see this boat. What a shame though, and this being such a small community as it is, that it has come to this.